On the 315th birthday of St. Petersburg, once again confirmed the status of the sea capital of Russia. The ships launched a copy of the legendary Poltava. In 1712, it became the first battleship of the Baltic Fleet and the first large ship built at the shipyards of the young capital. The history of the original "Poltava"
The linear three-masted ship "Poltava" was developed personally by the Emperor Peter I and his friend, master of shipbuilding Fedosey Sklyaev. June 15, 1712 newly battleship was launched and sent to Kronstadt for completion. According to the English rank classification, "Poltava" belonged to the fourth rank. Armament consisted of 54 guns, of which 22 guns were 18-pound, 20 guns - 12-pound and 12 guns - 6-pound. British officers who stayed in the Russian service, treated the ship's design critically. They argued that the stern part of the Poltava was heavily narrowed, which did not contribute to long sea trips. Nevertheless, the ship successfully participated in six battles of the Northern War and served the fatherland for more than 25 years. An important element of such a long life of the battleship was the quality of materials used in the construction. "Poltava" was made from well-dried wood, which at that time was a rare occurrence. After all, in the mass construction of ships, it was not possible to dry out and process the wood properly. When the emphasis is on quantity, quality almost always suffers. And Poltava was the first and only of its kind. On the question of how "Poltava" of the XXI century is similar to the original, ship enthusiasts proudly answer - by 95%. True, this had to work hard: there was almost no documentation on the battleship. Knowing that Peter was studying craft abroad, they turned to foreign archives. "Again they are all scattered. That is, not that the package of drawings on the ship. But from this ship there was a hull drawing, from this ship the midship remained, from this the layout remained, "says Oleg Korobkin, the chief designer of the Poltava ship," And you start putting these drawings together, so that you understand that Peter could build. " The documentation was only the first of the problems that arose. Almost all materials and products for the new "Poltava" were created by special orders, as the modern market does not meet the standards and needs of the shipbuilding of Peter's time. For a long time nobody has been supplying ship timber in the right amount, like ropes of the same diameter as in the 18th century. Another problem is the lack of specialists in this or that type of work. For example, ship caulkers. Even the certification services do not have criteria for assessing the reliability of such wooden ships and specialists who understand their parameters. As a result, if the ship was built under Petra in three years, the modern "Poltava" was almost five years old. "Even now there are details that we have not yet put on the ship, simply because there is no suitable log. We have to re-paste somewhere, but where we need to preserve the historical truth, we are waiting, we are looking for six months, a year. We are waiting for a suitable log to make the part, "Mikhail Plekhanov, the chief builder of the ship, shares. A separate story was fodder decor. A year and a half it took specialists only to study the details and study the peculiarities of decorating ships of the Baroque era. The fact is that the appearance of the famous "Poltava" came to us thanks to a single image - a small engraving of the Dutch artist Peter Picart. The result was a real work of art. A kind of triumphal symphony unfolds before the audience, celebrating Peter's victory over the Swedish invaders. Mermaids are laurels, the geniuses of Glory are trumpeting in the name of the emperor, and the double-headed eagle closely follows the state borders. Every detail has a deep meaning and is part of the history of the ship. "The Fall of Phaethon. The plot, which tells of Charles XII, who boldly tried to conquer Russia, but during the Battle of Poltava, failed. As Phaeton died because of his pride, so did Karl with his plans, "- says the artist-mariner Andrei Tron. The length of the hull is 40 meters, width - 12. Weight - one thousand tons. Masters with accuracy recreated the appearance of the ship. Do not forget about the armament. Soon, 54 cannons will be installed on the "Poltava". Lafetes will be painted in red. The choice of color is traditional for the fleet of the XVIII century. When the gun was fired, the gun rolled back two meters back, often crushing and maiming inattentive sailors. Blood spots merged with the color of the paint, and thus did not hurt the psyche . On the new "Poltava" guns will not be idle either. On holidays, they promise to give salutes from the guns. On the battleship the creators have big plans. 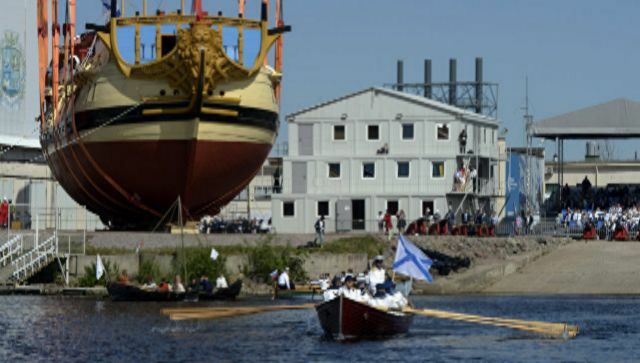 He should not only become a museum at one of the embankments of St. Petersburg along with the legendary cruiser Aurora and the icebreaker Krasin, but also take a place of honor at sea parades and city festivals.